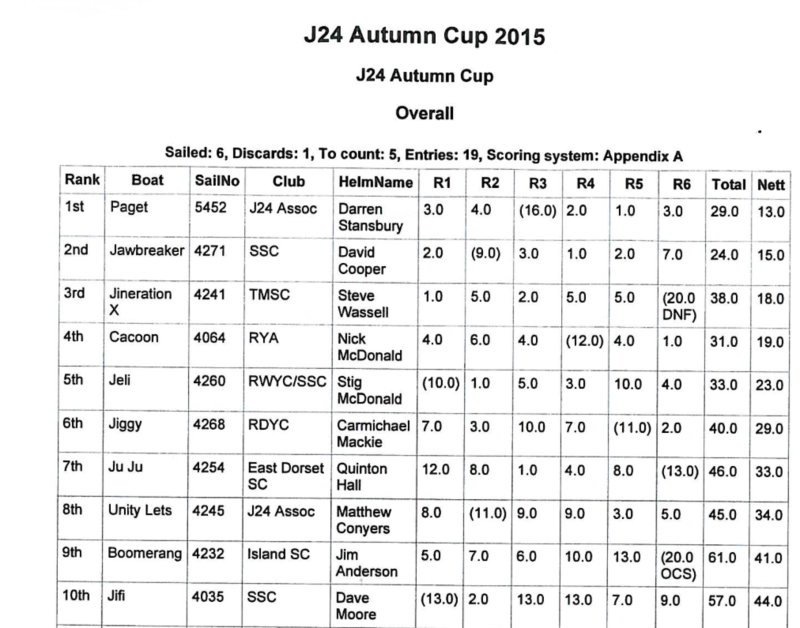 S.S.C in Plymouth was pleased to host the 19 boats that competed in this years J24 Autumn Cup. A good increase from 11 boats last year in our growing UK J24 fleet. The light and frequently changing wind made Saturdays racing a challange for the best of tacticians. The three windward leeward races brought out the best in the competitors with each race having a different winner. Race 1 saw Steve Wassell’s ‘Jineration X’ slide past Dave Cooper’s ‘Jawbreaker’ on the last run to take the honors. Race 2 saw the wind back 20 degrees and Dave Moores Westerly, ‘Jifi’, saw the shift ahead of the fleet to lead into the final leeward mark just for Stig in Jeli to see the last shift and pip Dave to the line. Race 3 saw carnage on the start line as the wind shifts continued. With numerous boats doing penalty turns. While everybody sorted themselves out 2 boats started the fight for victory. The lead changed hands between Quinton Hall’s ‘JuJu’ and Steve Wassell’s ‘Jineration X’, with ‘JuJu’ getting the best of the last run to take Race 3. Race 4 saw the fleet beat to the windward mark and race up the River Tamar to Saltash. Around 12 boats arrived at the top mark within 30 seconds of eachother making the run a competitive affair. Dave Cooper’s ‘Jawbreaker’ and Darren Stansbury’s new boat ‘Paget’ hotly contested the lead and it was the tactics of ‘Jawbreaker’ which won the day. After a discard Day 1 ended with ‘Jawbreaker’ (6) leading from ‘Jineration X’ (8) followed by ‘Jeli’ (9) and ‘Paget’ (9). Day 2 saw two races set in the River Tamar on Triangle courses in an increasing breeze. ‘Jawbreaker’ and ‘Paget’ contested Race 5 result with ‘Paget’ taking the win from ‘Jawbreaker’ in a tightly contested race. The final race saw some challenging conditions as the breeze increased and gusts of over 20 knots caused problems on the tight spinnikar leg. Nick McDonald’s ‘Cacoon’ managed the difficult conditions the best followed shortly by Carmichael Mackie’s ‘Jiggy’, which kept up the tone of the weekend with each race seeing a different winner. The J24 Class Association’s thanks goes to the Race Officers for their diligence in setting the courses in very difficult conditions. The Westerly prize was taken by Dave Moore’s ‘Jifi’. In the final analysis consistancy was the key to success and after taking out the discard ‘Paget’ prevailed to take the J24 Autumn Cup from ‘Jawbreaker’ and ‘Jineration X’. 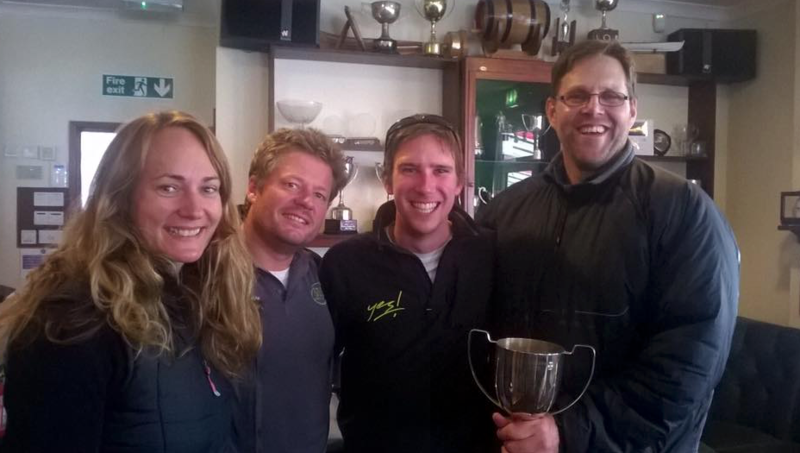 Special mention of Parkstone Youth Team who had a great first regatta sailing together. Thanks to David Cooper and the Plymouth team for helping them get on the water with the loan of ‘Nitro’. The whole event was a great success with class racing at its best, spread the word and let’s get the numbers even higher. It’s ‘more bang for your bucks’ in the J24 Class Association. Thanks go to Steve Wassell, ‘Jineration X’ for his report.